Non sibi sed patriae; "Not self but country" (अनाधिकारिक). 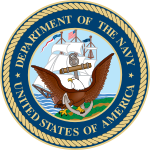 ↑ "Navy Traditions and Customs". Naval Historical Center. United States Navy. अभिगमन तिथि 2009-01-24.